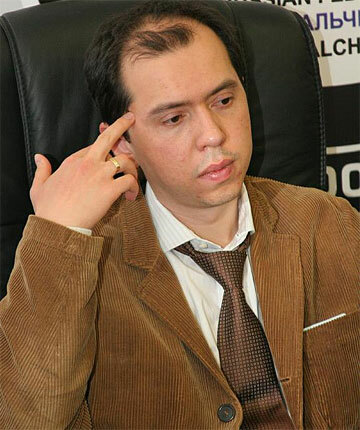 7/21/2011 – Uzbek-born grandmaster and former FIDE knockout world champion Rustam Kasimdzhanov, now a permanent second of World Champion Vishy Anand, is a profound thinker, and not just in chess openings. He has now written an open letter to FIDE, describing the current unsatisfactory situation in top professional chess and proposing a startling solution. I am writing this open letter, addressed both to FIDE and the entire chess playing world, due to a certain crisis, in which our noble game finds itself lately. This crisis is not only defined by a general dissatisfaction, coming from sponsors, organizers and amateurs; also among the professionals, there has been some growing distress. Quite a number of traditional tournaments are no longer organized; in those still out there an ever growing number of extremely strong players is competing for the same money. At the same time, voices from all around are expressing serious concern about lackluster play in some top tournaments, and notorious short draws. To understand the reasons why our sport has never made it to the heights it deserves I find it useful to take a look at a sport very similar to ours – tennis. Both games feature the battle of two personalities, showing a whole array of technical weapons in their fight, competing in speed and precision, in patience and wisdom. Why, despite these apparent similarities, despite the fact that many more people worldwide are capable of playing chess properly, do we stand light-years behind tennis in everything that defines success in professional sport? The reasons are numerous, no doubt, but the main problem, as I see it, is an existence of a draw as a result in chess. Short draws (and I also have made a number of those) make our game look more like an insider academic activity, rather than sport; but they can't be avoided – the preparation of today and the inherent qualities of chess are such, that a draw, and in fact a short draw, is a most likely result in a game between strong well-prepared players. Still, in a well-organized tournament, top players, getting up to go to their hotel rooms after a ten-minute draw, do not add attractiveness to chess. Returning to tennis, the main attraction is, as I see it, the fact that every single fight produces a result; a winner and a loser at the end of the day. And there is a thrill for every spectator to see, say, Nadal and Federer, come to court and know with certainty that one of them will triumph and the other one will lose. In short, to put it figuratively, there will be blood. And there will be great champions. In our game, however, things are different. We also have great champions, but their greatness is sometimes limited to insiders of the game. In order to be successful outside of our little world, in order to make front pages and TV, and thereby also the finance that comes in a parcel, we need champions that appeal to a general public, even to a public far from intricacies of chess. Such was a winning streak of Novak Djokovic this year, for instance. Something that a win in a chess super tournament with 8 out of 13 simply cannot match. And now comes my proposal. If we want success, sponsors, public and the rest of the parcel, we need to abolish those draws in classical tournaments. And not by Sofia rules – tournaments with Sofia rules produced as many draws as any other; and not by 30 move rule, where players are often just waiting for move 30. We need something entirely different. Like a tie-break in tennis. We need a result. Every single day. This way the expectations of the crowd will never be deceived. There will always be a winner, there will always be blood. There will come an age of great champions, since with this system there will be times when Vishy or Magnus will win Wijk-aan-Zee with 13 out of 13; and there will be winning streaks, when some of the great champions will win 50 games in a row. We'll make front pages. And much more than that. It will be good for our sport. Not just sponsors and attention and prizes. It will be essentially good for our game. People will try extremely hard with white, in order to decide the issue now, and not in a black rapid game. Instead of offering a draw in a slightly better ending in order to save energy and catch a movie, chess players will show their whole ability and will win these endings. As a matter of fact, this will develop classical chess. And there is so much more. Often players, playing white, feeling rough in the morning, get to the game with an attitude "I'll just make a draw today" Imagine, what will happen to this attitude? Chess will become a true sport. We'll wake up to win or to lose that day. We'll come to the board, ready to play chess. And just like when we come to see Federer play – we see his whipping forehand, his effortless slice, his hammer serve and immaculate return – same will happen in chess. Every single day we'll see players like Aronian or Grischuk pressing with white, wriggling out of trouble with black and showing some blitz skills to an ever larger public. That is something I would like to watch and play. I don't agree with your proposal, Rustam. I do not agree AT ALL. (1) There is nothing wrong with draws; there is nothing wrong with Chess, nor with Classical Chess. (2) There is no "crisis" either, nor a "certain" crisis in our game, as you mention in your rather artificial open letter above. (3) What we do have in chess, instead, is a number of people deluded by the idea that Classical Chess ought to be providing for them, much, much more monetary profit than they're actually getting from it. Among these, and not surprisingly, we have live commentary veterans, frustrated ex-players and other similar and not very talented has-beens, and a few ill-advised tournament organizers that would like to see Classical Chess, the gem of our cherished game and its true heritage, modified (! ); modified so it can fit their greedy, small-minded agendas. However, and not surprisingly (again), these people don't have the courage to be open about their true motivations, for if they were, they'd find nothing but outright rejection from people, and so, they tell the public instead that Classical Chess is (supposedly) in serious need of reformation (adjustment, renovation, improvement, etc, etc), and that they're doing the chess community nothing but a service (!) when they inform us about this. No, Rustam. Classical Chess is perfect the way it is, long time-controls and draws included. For shortening its time-control to four or five hours (instead of the usual 7 or 8) would only eliminate its main asset, i.e., its higher quality, which rests upon the large ammount of time that players are provided in order to think and create (- chess makes you think and create, because of its endless complexity; there are other, faster forms of Classical Chess, like Rapid or Blitz chess, that already satisfy our needs for faster games -), while eliminating draws would introduce an artificial, and ultimately false element to it, since in many occasions it is the case that neither you nor your opponent played better than the other: forcing a decisive result where there isn't one would be unfair to both players, and therefore, contrary to the spirit of our game.